Project Scope: GreenWorks Idaho, the organization behind the Idaho Green Expo, is a grass-roots, community-based, non-profit organization building community partnerships for a sustainable future. Their goal is to educate and inspire our community about the importance of adopting sustainable living practices and supporting businesses as they transition into the emerging green economy. 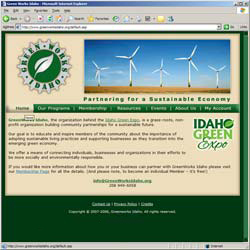 The site also has a carbon offset calculator where one can determine the amount of carbon they produce and purchase offsets that are invested in local Idaho sustainablity projects. Database Tools: Businesses can maintain their company profile and renew their yearly membership. A email blast tool was also developed allowing GreenWorks employees to send out their e-newsletters.